Pierre-deschênes, Claudine. 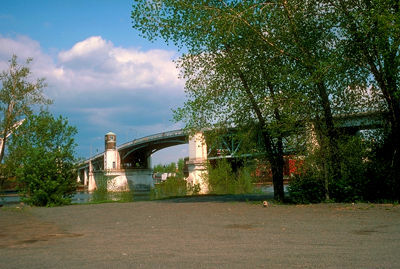 "Lac-Mégantic (town)". The Canadian Encyclopedia, 04 March 2015, Historica Canada. https://www.thecanadianencyclopedia.ca/en/article/lac-megantic. Accessed 22 April 2019. The town of Lac-Mégantic was incorporated in 1907. Its population was 5,932 according to the 2011 Census and 5,967 according to the 2006 Census. The town of Lac-Mégantic was incorporated in 1907. Its population was 5,932 according to the 2011 Census and 5,967 according to the 2006 Census. Located in the Eastern Townships of Québec, Lac-Mégantic is Le Granit Regional County Municipality’s centre of industry (lumber and granite), administration and commerce. On 6 July 2013, a devastating train derailment occurred in Lac-Mégantic. The town of Lac-Mégantic is located 95 km east of Sherbrooke on the northeast shore of Lake Mégantic. Mont Mégantic (1,100 m), 50 km away from Lac-Mégantic, is home to a nature and astronomy interpretive centre (ASTROLab), Mont-Mégantic National Park, and an astronomical observatory. This observatory is used by the Université de Montréal and the Université Laval and is equipped with a telescope 1.6 m in diameter, the largest in eastern North America. 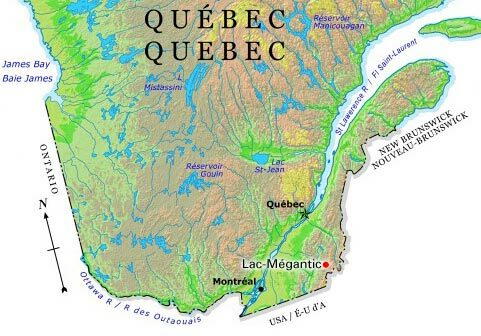 The source of the Chaudière River is Lake Mégantic, which takes its name from an Abenaki word meaning “place where fish are found.” The river was once a transportation route for the Abenaki people. The first settlers in what is now Lac-Mégantic were Scottish and came in the mid-19th century. From then on, the history of the town would be closely tied to the railway. For example, Sainte-Agnès Parish in Lac-Mégantic is named for Susan Agnes Bernard, wife of John A. Macdonald, because the couple visited the town to promote railway development. The railway was inaugurated in 1878 in Lac-Mégantic and was integrated into the Canadian Pacific Railway network in 1894. Today a commercial, industrial and tourist hub, the town also provides services to the surrounding region and houses the large Baie-des-Sables recreational complex. A train disaster occurred on 6 July 2013, killing 47 people and destroying a large section of downtown Lac-Mégantic. Around 11:30 p.m. on 5 July, firefighters from the municipality of Nantes were called to a fire inside one of five locomotives on a train from the Montreal, Maine and Atlantic Railway company. While fighting the fire, the firefighters shut off the engine, thereby deactivating the air brake system. 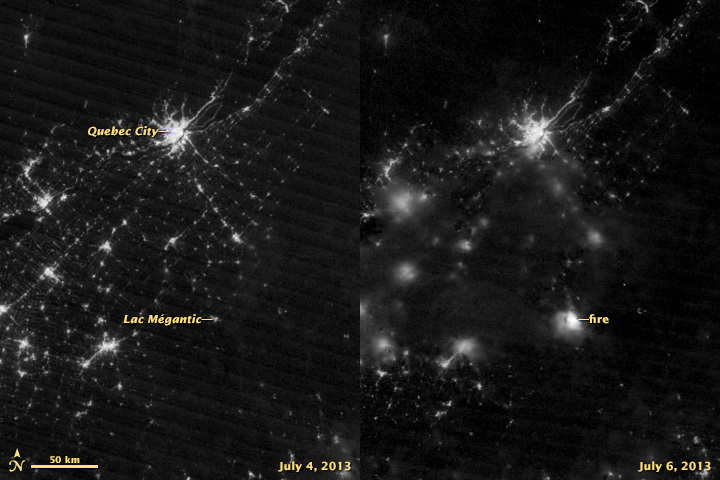 Because there were not enough hand breaks and there was a steep 1.2 per cent gradient from Nantes to Lac-Mégantic, 72 tank cars carrying light crude oil rolled downhill with no conductor on board and derailed in downtown Lac-Mégantic, causing a series of explosions and a massive blaze that was visible from space. It was one of the largest hydrocarbon fires in North American history. A Transportation Safety Board of Canada inquiry revealed that a broken piston likely caused the locomotive fire and that the tank cars the railway company used were not suitable for transporting the type of oil concerned. In addition to the human tragedy, more than 100,000 litres of crude oil were spilled into Lake Mégantic and the Chaudière River. Major rail accident in Lac-Mégantic, QuebecKey facts and reports about the deadly explosion of fuel stored in the runaway tanker cars that derailed in Lac-Mégantic, Quebec, on July 6, 2013. From the Transportation Safety Board of Canada. Lac-Mégantic: TSB says no single factor to blame for derailmentA CBC News story about the Transportation Safety Board report on the deadly train accident in Lac-Mégantic, Québec.